[Steve Martin] used to do a comedy act about “Let’s get small!” You have to wonder if [Paul Klinger] is a fan of that routine, as he recently completed a very small 3D printed PC that plays snake. Ok, it isn’t really a PC and it isn’t terribly practical, but it is really well executed and would make a great desk conversation piece. You can see the thing in all its diminutive glory in the video below. The 3D printer turned out a tiny PC case, a monitor, and a joystick. The PC contains an ATtiny1614, an RGB LED, and some fiber optic to look like case lighting. The monitor is really a little OLED screen. A 5-way switch turns into the joystick. There’s something mesmerizing about delta robots. Whether they are used at a stately pace for a 3D-printer or going so fast you can barely see them move in a pick and place machine, the way that three rotary actuators can work together to produce motion in three axes is always a treat to watch. Especially with a delta robot as small as this one. [KarelK16] says this is one of those “just because I can” projects with no real application. And he appears to have been working on it for a while; the video below is from eight years ago. Regardless, the post is new, and it’s pretty interesting stuff. The tiny ball joints used in the arms are made from jewelry parts; small copper crank arms connect the three upper arms to micro-servos. The manipulator [KarelK16] attached is very clever, too – rather than load down the end of the arms with something heavy, a fourth servo opens an closes a flexible plastic grasper through a Bowden cable. It’s surprisingly nimble, and grasps small objects firmly. There are certainly bigger deltas – much bigger – and more useful ones, too, but we really like this build. And who knows – perhaps model robotics will join model railroading as a hobby someday. If it does, [KarelK16]’s diminutive delta might be the shape of things to come. What Is This, A Controller For Ants?! What’s the smallest controller you’ve ever used? [BitBuilt] forum user [Madmorda] picked up a cool little GameCube controller keychain with semi-working buttons at her local GameStop. 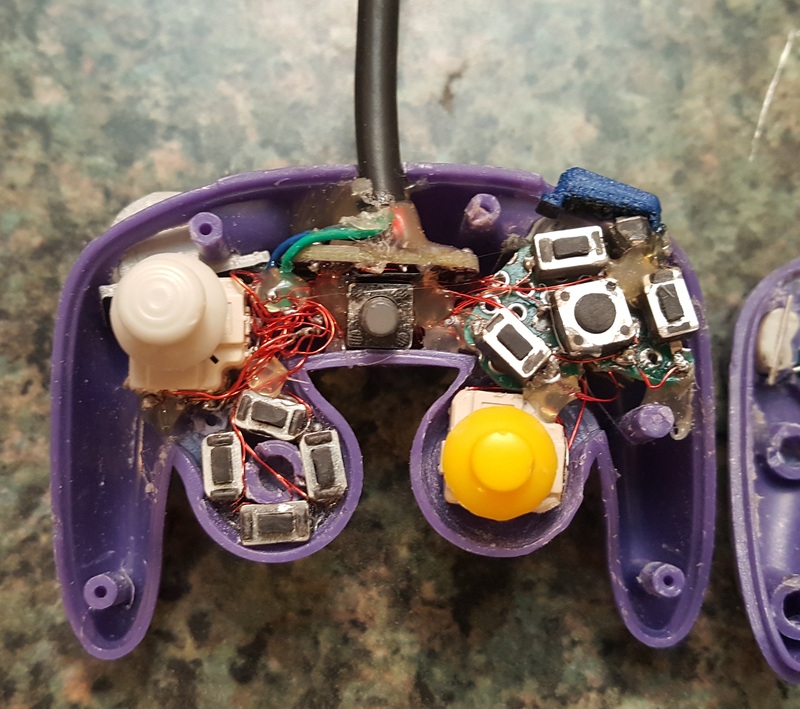 As makers are wont to do, she figured she could turn it into a working controller and — well — the rest is history. This miniaturized controller’s original buttons were essentially one piece of plastic and all the buttons would depress at once — same goes for the D-pad. Likewise, the original joystick and C-stick lacked springs and wouldn’t return to a neutral position after fidgeting with them. To get the ball rolling, [Madmorda] picked up a GC+ board — a custom GameCube controller board — just small enough to fit this project, eleven hard tact switches for the various buttons, and two squishy tact switches to replicate the original controller’s L and R button semi-analog, semi-digital functionality. Most of us would probably like to have an arcade cabinet at home, but it’s hard to justify the space they take up. Sure it’s an awesome conversation starter when friends are over, and you might even play it regularly, but at some point you’ll look over at the corner and realize there’s probably something more practical you could be doing with that particular section of the room. Perhaps the solution is to just make a smaller one. You could do one at half scale, or even desktop sized. But why stop there? Why not make one so small that you could put the thing in a drawer when you don’t need it? 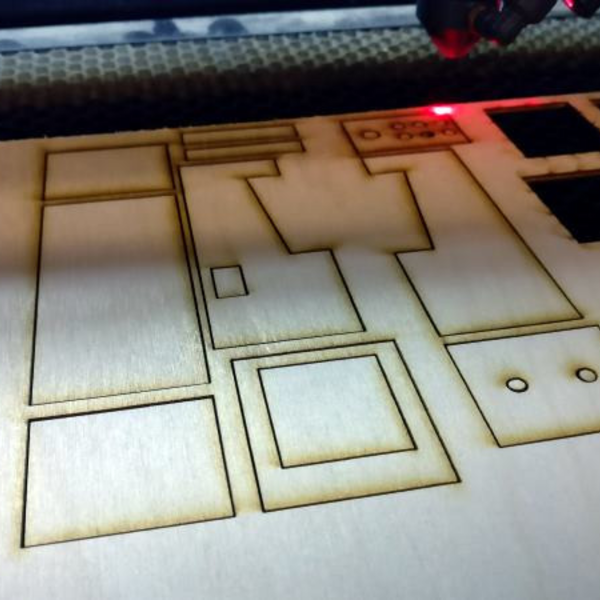 While it might be more of an academic experiment than a practical entertainment device, [RedPixel] has managed to create just such an easily concealable arcade cabinet out of a Pi Zero and laser cut wood. At only 83 mm high, this may well be the smallest functional arcade cabinet ever made (at least for now). All of the cabinet parts were drawn in Inkscape and cut out of 3 mm plywood. The buttons and joystick are wired directly to the Pi Zero’s GPIO pins and configured with Adafruit-retrogame. The display is a SPI ILI9163, which [RedPixel] previously documented on his site. The Pi is running the ever-popular RetroPie, which allows this tiny arcade cabinet to emulate 1000’s of console and arcade games, assuming you can deal with the controls anyway. While [RedPixel] has uploaded a video of his lilliputian cabinet running an emulator, there’s no video of him actually playing the thing. While we don’t doubt that it functions as advertised, gameplay on such a tiny array of inputs must be very difficult. This may be the smallest functional arcade cabinet to date, but it isn’t without challengers. We’ve covered a number of very impressive builds that manage to invoke the look and feel of a hulking coin-up despite fitting neatly on your desk. How do you classify something that is gigantic and miniature at the same time? LEGO kit 850, from 1977 when it was known as an Expert Builder set, was 210 modular blocks meant to be transformed into a forklift nearly 140mm tall. [Matt Denton] scaled up the miniature pieces but it still produced a smaller-than-life forklift. This is somewhere in the creamy middle because his eight-year-old nephew can sit on it but most adults would demolish their self-esteem if they attempted the same feat. [Matt] has been seen before building these modular sets from enlarged LEGO blocks, like his Quintuple-Sized Go-Kart. He seems to have chosen the same scale for the pieces and who wouldn’t? If you’re printing yourself a ton of LEGO blocks, it just makes sense to keep them all compatible. Isn’t combing all your sets into one mishmash the point after all? We’ll see what his nephew/co-host constructs after his uncle [Matt] leaves. In the time-lapse video after the break, you can see how the kit goes together as easily as you would hope from home-made bricks. With that kind of repeatability and a second successful project, it’s safe to say his technique is solid and this opens the door to over-sized projects to which LEGO hasn’t published instructions. Hackaday is bursting with LEGO projects, K’Nex projects, and even Erector set projects. In a clever bit of miniaturization, [JediJeremy] has nearly completed a gyro-mouse controller for a Raspberry Pi Zero! Ultimately this will be a wearable Linux-watch but along the way he had some fun with the interface. Using the MPU6040 gyroscope/accelerometer card from a quadcopter, [JediJeremy] spent a week writing the driver to allow it to function as a mouse. Strapping an Adafruit 1.5″ PAL/NTSC LCD screen and its driver board to the Zero with rubber bands makes this one of the smallest functional computer and screen combos we’ve seen. Simply tilt the whole thing about to direct the cursor. Building a MAME machine around a Raspberry Pi has been the standard build for years now, and tiny versions of full-sized arcade machines have gone from curiosity to commonplace. [diygizmo] just built one of these tiny arcades, but the fit and finish of this one puts it above all others. There’s a real, miniature joystick in there, along with 3D printed adapters for tact switches to make this one look like a lilliputian version of a full size standup MAME cabinet. The entire enclosure is 3D printed, and most of the electronics are exactly what you would expect: A Raspberry Pi, 2.5″ LCD, and a battery-powered speaker takes up most of the BOM. Where this build gets interesting is the buttons and joystick: after what we’re sure was a crazy amount of googling, [diygizmo] found something that looks like a normal arcade joystick, only smaller. Unable to find a suitable replacement for arcade buttons, [diygizmo] just printed their own, tucked a tact switch behind the plastic, and wired everything up. Add in some decals, paint, and the same techniques used to create plastic model miniatures, and you have a perfect representation of a miniature arcade machine.